Nelson Mandela is one of the great moral and political leaders of our time: an international hero whose lifelong dedication to the fight against racial oppression in South Africa won him the Nobel Peace Prize and the presidency of his country. Since his triumphant release in 1990 from more than a quarter-century of imprisonment, Mandela has been at the center of the most compelling and inspiring political drama in the world. As president of the African National Congress and head of South Africa’s anti-apartheid movement, he was instrumental in moving the nation toward multiracial government and majority rule. He is revered everywhere as a vital force in the fight for human rights and racial equality. The foster son of a Thembu chief, Mandela was raised in the traditional, tribal culture of his ancestors, but at an early age learned the modern, inescapable reality of what came to be called apartheid, one of the most powerful and effective systems of oppression ever conceived. In classically elegant and engrossing prose, he tells of his early years as an impoverished student and law clerk in Johannesburg, of his slow political awakening, and of his pivotal role in the rebirth of a stagnant ANC and the formation of its Youth League in the 1950s. He describes the struggle to reconcile his political activity with his devotion to his family, the anguished breakup of his first marriage, and the painful separations from his children. He brings vividly to life the escalating political warfare in the fifties between the ANC and the government, culminating in his dramatic escapades as an underground leader and the notorious Rivonia Trial of 1964, at which he was sentenced to life imprisonment. Herecounts the surprisingly eventful twenty-seven years in prison and the complex, delicate negotiations that led both to his freedom and to the beginning of the end of apartheid. Finally he provides the ultimate inside account.The famously taciturn South African president reveals much of himself in Long Walk to Freedom. A good deal of this autobiography was written secretly while Mandela was imprisoned for 27 years on Robben Island by South Africa’s apartheid regime. 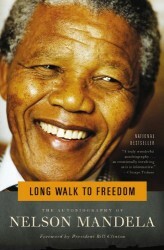 Among the book’s interesting revelations is Mandela’s ambivalence toward his lifetime of devotion to public works. It cost him two marriages and kept him distant from a family life he might otherwise have cherished. Long Walk to Freedom also discloses a strong and generous spirit that refused to be broken under the most trying circumstances–a spirit in which just about everybody can find something to admire.